Was just looking at this. Only downsides are only 8gb of Ram and the GTX 1060 is Max Q, so about 10-12% slower than the standard version. Was just looking at this. Only downsides are only 8gb of Ram and the GTX …Was just looking at this. Only downsides are only 8gb of Ram and the GTX 1060 is Max Q, so about 10-12% slower than the standard version. "Battery LifeThe Omen 15 is hardly suitable for longer excursions beyond the power grid. 3:18 hours of Internet surfing via WLAN with a brightness of 150 cd/m² are as limited in the year 2017 as 3:44 hours of HD-movie enjoyment (also with reduced brightness). In the best case, i.e., with minimal brightness and no load present, the 70-Wh battery lasts a little over 4 hours. In 3D operation with maximum brightness, you can count on 1 to 1.5 hours"
The whole point of Max Q is to deliver a cooler, more energy efficient laptop. According to the review, it does neither, making Max Q on this particular laptop pointless. You're essentially paying the same price for a slower GPU with no apparent benefits. I'm not hating on Max Q itself, just on its implementation on this laptop. It's basically a downclocked version of the GPU that's supposed to be more energy efficient. In this laptop, it's not. Another thing anyone thinking of buying this laptop should consider is the quality of the screen, apparently it's terrible. If you're going to go for this, get the one with the 120hz screen option. I currently have the i5 variant of this exact machine. I agree that the battery life is not great. It's definitely quiet though, with a great thermal design. I really like the chassis. It's very thin for a gaming laptop. I have the 120hz screen which is really nice. Overall I'd definitely recommend it. However, I'm returning it as I have just purchased the msi GTX 1070 & mixed reality headset bundle for little over £1300 from Amazon. I'm hoping it feels as premium as the omen. Guys the screen on this one is really bad for this model either go for the 120hz screen or 4k the other default one has terrible brightness and bad colour before buying i would recommend checking out the model at pc world or john lewis. I've been looking for ages for one these kind of spec laptops but just get put off all the time. Screen is the main thing. Should I go msi , asus, hp, dell, medion.....? I've been looking for ages for one these kind of spec laptops but just get …I've been looking for ages for one these kind of spec laptops but just get put off all the time. Screen is the main thing. 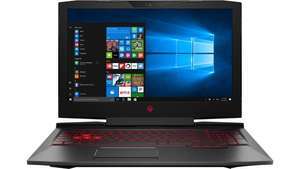 Should I go msi , asus, hp, dell, medion.....? I have just received this and it has the 120hz screen. Bargain! Hi, does it have g-sync and 120hz display?